Roman Abramovich's Impulse VC Investment Fund has become a shareholder in Anchor.Travel, a yacht rental site. By 2018 the Russian startup company intends to occupy seven percent of the international market. Sergei Medvedev and Stanislav Kharlamov, two young entrepreneurs, met eight years ago in a pub on St. Patrick's Day. In 2014 the partners launched a yacht and motorboat rental service called Anchor.Travel. The startup operates in the sharing economy segment, which is quickly becoming an important part of the international market. The essence of this business model is that it gives customers the option of renting accommodations and transportation instead of buying them. 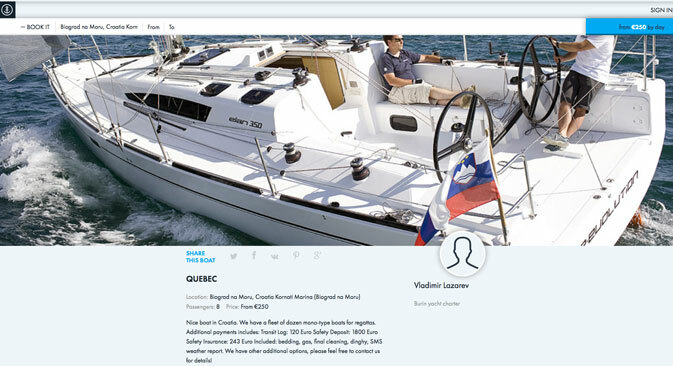 Currently, its competitors in the global yacht rental market are the American boatbound.com and the French sailsharing.com. Anchor.Travel's main advantage is its database interface, which uses a map with the yachts positioned in their various locations. As a result of this concept, a client can choose a vessel and a corresponding travel itinerary within seconds. At the moment Anchor.Travel's database consists of 96 boats, but the company plans to bring that number up to 2,000-3,000 by the end of 2015. "For the last five years I've been sailing rather actively," says Medvedev. "The boat rental market today has been stuck somewhere since the beginning of the 2000s as the booking process takes place manually. To rent a yacht I have to spend about two weeks." In Medvedev's experience, in order to rent a boat today a client turns to a tourism or charter company and receives a list of boats in the area of interest and the contact information of the boats' owners. Then they call the harbor and ascertain whether the boat is available. It is often the case that the selected boat is already reserved or has even sunk. Moreover, the vessel's price is often higher than initially listed. According to Medvedev, the world charter boat market consists of approximately 15,000 units, with a total value of about $500 million. Anchor.Travel's commission is 10 percent, which is up to 2.5 times lower than the market average. This lower markup is possible because superfluous steps are removed from the client-boat owner chain. Medvedev says that Anchor.Travel charges an average of 2,500 euros to rent a yacht for a week. The price depends on the boat's age, size and the season. Medvedev and Kharlamov plan to reach a monthly figure of 100-150 boat rentals per week by the end of 2015 with annual revenue of about $1.1 million. Roman Abramovich's Impulse VC Investment Fund became an Anchor.Travel shareholder in December 2013, although how many shares he owns remains unknown. The Russian startup intends to operate globally, because as Medvedev points out the Russian fleet does not even contain 100 boats. The entrepreneurs will promote their service internationally through search engines, contextual advertising, specialized publications and social media networks. By 2018 the service intends to occupy seven percent of the world yacht and motorboat rental market and bring in $6 million annually. Medvedev estimates that the company will start turning a profit in one to 1.5 years. The partners intend to promote sailing as an accessible pastime for all kinds of people. "The weekly cost of renting a yacht for six people will be 400 euros a person, which is cheaper than the cost of staying at a hotel for the same period," says Medvedev. Abramovich invests in new shale technology in the U.S.
Alexei Tuknov, the investment director at Maxfield Capital, says that the sharing economy model becomes very popular in times of economic instability. "Transportation, tourism and accommodations are the largest segments in the sharing economy," explains Tuknov. "Anchor.Travel is faced with several challenges and if it overcomes them, it can become a leader in its niche,” Tuknov continues. “The fundamental thing is security and trust in the deal from both sides. This can be obtained through insurance, an ergonomic site, authentication, reputation and social scoring. Anchor.Travel is aiming at a market that has lots of potential and whoever becomes the segment leader will receive most of the demand."